Outstanding Results After Just One Session! An experimental research study was conducted in Vancouver, Canada in 2011, using EPI/GDV (Electrophotonic Imaging/Gas Discharge Visualization) equipment to measure the effects of the self-healing Dalian Method™ (DM). Devised by Dr. Konstantin Korotkov and his team, the EPI/GDV technology is an accepted device used in the mainstream Russian medical system. It uses Kirlian photography, and is based on the principles of Traditional Chinese Medicine (meridians), Vedic wisdom (chakras), and Western medicine (systems and organs). The study involved fourteen adults (eleven women and three men), ages thirty to sixty-five, who had no previous experience with the Dalian Method. Participants completed self-evaluation questionnaires about their physical, mental, emotional, and spiritual states before and after their sessions. Various ailments like headaches, sleep disorders, tense muscles and pain (back, shoulders, neck, elbow, knee, feet, stomach), fibromyalgia, lupus, arthritis, sciatica, high blood pressure, tiredness, skin rashes, fibroids, digestive issues, weight issues, Graves’ disease, thyroid conditions, as well as emotional challenges like depression, anxiety, nervousness, low self-esteem, resentment, anger, sadness, and stress were reported by the participants prior to their DM session. To measure the participants’ physical, psychosomatic, and bioenergetic states, scans of their fingertips were captured with the EPI/GDV equipment before and after their self-healing DM sessions. Through the fingertip scans the equipment generated a series of computer-simulated images (see Illustrations 9 to 20 on pages 85 through 96) of the person’s energy field, cardiovascular, respiratory, immune, and nervous systems, and chakra states. The findings, both through the EPI/GDV imaging and post-session self-evaluation questionnaires, demonstrated impressive results. The images taken with the EPI/GDV equipment demonstrated noticeable improvement from pre- to post-session states. Restoration of the entire bio-field and closing of obvious energy leakage spots occurred after the self-healing DM session. The participants who had a generally coherent energy field prior to their session demonstrated increased luminosity in their post-session bio-field images. Other documented results included synchronization of right/left brain hemispheres, decreased stress levels, increased mental clarity, heightened states of awareness, overall strengthening of internal organs, balancing of the energy centers (chakras), and harmonizing of the energy field. Using self-evaluation questionnaires, participants indicated their level of physical pain, severity of emotional issues, level of energy, and clarity regarding their particular issues before and after their self-healing DM session. The common thread in everyone’s experience following their DM session was feeling lighter, calmer, more clear, and more in touch with their inner being. All of the participants reported decreases in the severity of their pain and emotional issues. They gained greater clarity and understanding about the root cause of their problems, or what their pain was trying to “teach” them. They also reported feeling more energized, centered, free, grounded, and present. The before diagram shows energy leakages in many areas of the participant’s body, including areas of severely depleted energy in her right shoulder, arm, wrists, legs, and knees due to worry, anxiety, and insecurity. The after diagram clearly demonstrates how the energy leakages were closed after the participant’s self-healing DM session, dramatically strengthening and balancing her overall energetic field. 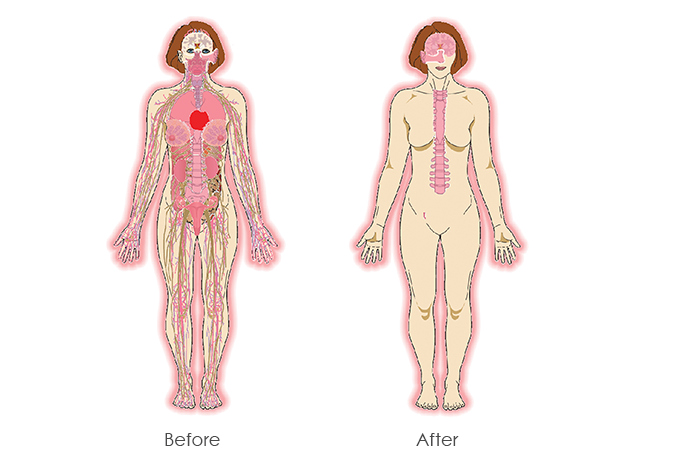 The above diagram shows the state of the participant’s physical organs and body systems before and after her self-healing DM session. The before diagram indicates high stress levels in the entire body and nervous system. It shows congestion and blockages in her lungs, pineal and pituitary glands, and a heightened level of anxiety in the heart chakra related to the trauma she experienced from her husband’s sudden death. There is also congestion in her digestive, endocrine, immune, locomotor, and urogenital systems due to all the thoughts and emotions repressed in her body over time. The after diagram illustrates how the digestive, endocrine, immune, locomotor, nervous, and urogenital systems relaxed following her self-healing DM session. As a result of heightened awareness and increased energy flow (after releasing the repressed thought-forms and emotions from her body), there is a heightened activity in the brain, pineal and pituitary glands. The after diagram also indicates that there are other, deeper layers of repressed thought-forms and emotions that have accumulated in her body over the years, and it would be to her advantage to continue releasing and transforming them in her subsequent sessions. 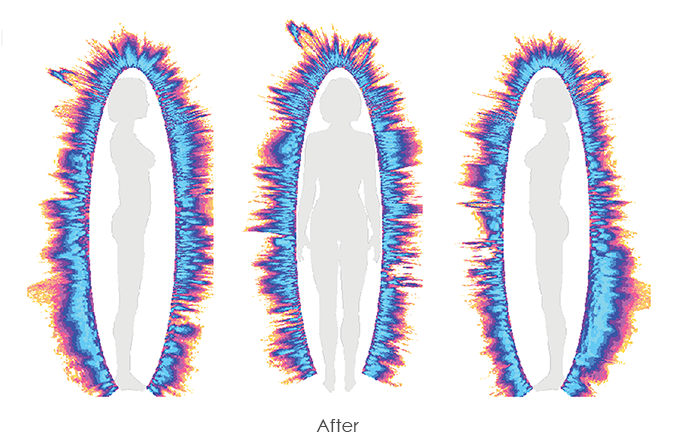 The above images show the chakra system readings before and after the same self-healing DM session. The before diagram illustrates a chakra system that is weak and out of alignment. The first three chakras in particular, associated with sexuality, survival and personal power, are constricted and off balance. They indicate that the participant’s awareness was scattered and not grounded in her body. The after diagram illustrates aligned and significantly stronger chakras with a remarkable increase in their size. This also shows an expanded state of self-awareness, inner strength, centeredness, and self-sufficiency. Harmonizing of the entire energy field. A Boxed set. Includes a 188 page Book with colour illustrations and 2 CDs – 98 and 74 minute versions of the self-healing Dalian Method™ (DM) sessions. Also includes Free Unlimited Q&A Support Calls with Mada about your practice with the method. A lifetime gift for you and your loved ones!